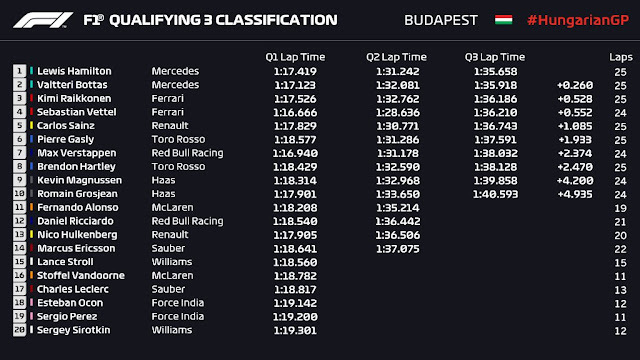 Brutal heat on track was the story of FP3, with the track up to 58°C by the end of the session, which saw Vettel looking quite comfortable at the top, and Mercedes, to the surprise of no one, struggling a bit with the tyres given the high track temps. Even with that, Bottas was just a tenth off Vettel's time and in possession of FP2, but a late run saw him spinning off the same spot on the track as his teammate, Hamilton, in T6, and giving the Armco a firm test, which, fortunately for Merc, left him reasonably undamaged. 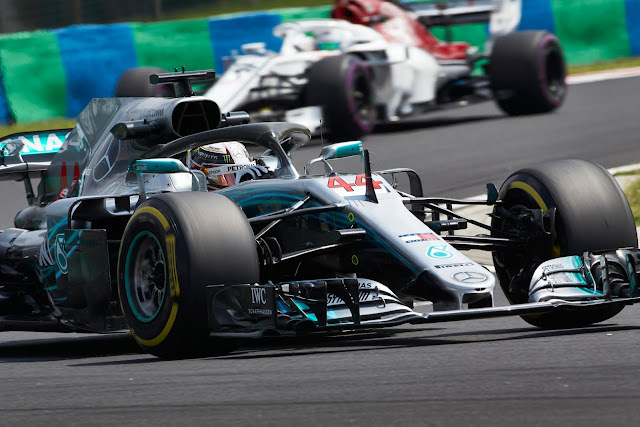 Lewis was able to do no better than P4, having been unable to put 3 solid sectors together, and a radio call with his engineer revealed not only were they working on a 2 lap prep, but that the rears were overheating whilst the fronts were in the window on his car, which was the factor robbing him of grip in the twisty middle sector. Red Bull were even worse off after a promising FP2 and the appearance of being in it for the win. Today's session left them well off the pace, looking for answers where there are none. But the questions are fairly straitforward, is their slump in form due to a lack of punch from their spurned PU partner Renault; a McLarenesque chassis fault; or a total dedication to 2019 given the need to package (and develop) the Honda PU that they have selected. Of course, that's a false choice and the answer is certainly down to some of each, shaken, not stirred. Renault and HAAS once again battled for best of the rest in FP3, and that struggle will continue in qualifying as well. One would suppose that HAAS will have the advantage, with all Ferrari teams now having the new spec PU. But the real story of the midfield had to be Force India having gone into administration. The short story is that supposedly Mercedes used Perez as a stalking horse to make it happen, as Force India owe the driver $4 million but the combined Daimler, HPP and GP group somewhere in the neighbourhood of $13 million. Probably worth chucking in that it was Williams, the sole team to vote to refuse to allow FI to get early release of last year's prize money that probably started them down the path. K-Mag rethought his strategy, and was out on the Wet tyre, going P9 with his teammate P10. Under 6 minutes to go, both Toro Rossos were in good shape, P5 and P7 for Gasly and Hartley respectively, and conversely it was Hulkenberg and Ricciardo in difficulty as push was well on its way to meet shove. With a 2 second gap from P11 to P10, and the rain not abating, it looked unlikely at best. The glory shot of the Williams at 3 minutes to go, coming down the straight, showed just what Brawn et al mean when the talk about outwash from the front tyres, spray billowing bowlegged out from the front axle. And just as Alonso predicted, there would be no improvement as the track conditions stayed worse with fewer runners on track to clear water. 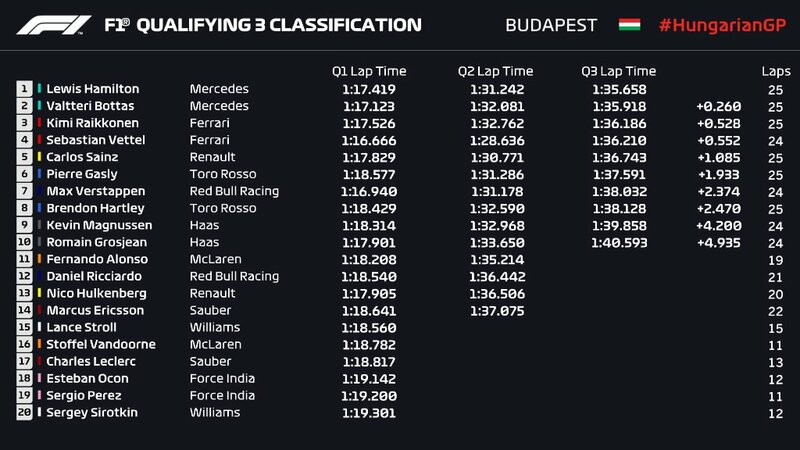 Thus it was Alonso, Ricciardo, Hulkenberg, Ericsson and Stroll going no further, off in search of some palinka to drown their sorrows as the rest got ready to tilt for all the marbles. Renault confirmed it was a problem with the fuel bowser that accounted for his surprise exit of Hulkenberg, keeping him off track during the best conditions of the session, but there was rather less information immediately available for Ricciardo's ouster. Turns out it was Stroll, spinning directly in front of him and bringing out the yellows, that put the knife firmly into his chances as by time he reset the best times had gone away. Hamilton's first go round came up 0.2 seconds off Raikkonen and with just a minute left, Vettel was off on his final turn, in P4 and behind Sainz. Kmag P9 with one more go as RoGro was massively balked by Verstapen. Hamilton, was turning up purples in his fierce battle against Raikkonen as Vettel finished off his final sector, and went P2 as he had a bit of a moment out of the last turn that cost him some time. Bottas next and to the top!!! Provisional pole for the Finn as Lewis rounded T14 and once again took P1, making it a front row lockout with just Gasly left to go. No surprises then as Gasly didn't threaten the sharp end but surprise enough for Toro Rosso as he did go P6. Mercedes managed once again to stun Ferrari and with Raikkonen and Vettel behind them, followed by Sainz and Gasly, tomorrow's start was looking fairly entertaining. Indeed, given the long, Barelona-esque run down to T1, the potential for tears is large, but the lingering question is for whom those tears will be shed.